Recently Garr Reynolds posted an analysis of the presentation styles of Bill Gates and Steve Jobs. Garr's tone is respectful and yet humorous, with digs about Bill's obsessive use of the word 'rich' and the Steve's theatrics. But there are great insights in this post, including Garr's conclusion that "...the biggest difference is not the fact that Steve's slides are simpler with fewer elements and fewer bullet points, the biggest difference is in the way they are used." Presentation Zen is one of my favorite blogs. Folks in the educational technology community will no doubt be aware of the OLPC project championed by MIT Media Lab founder Nicholas Negroponte. Conceptualised as a poverty alleviation scheme, Nick's vision is a US$ 100 sub-notebook to get kids communicating and sharing over Wifi networks. And it's packed with learning oriented software and an innovative user interface. However, like the X-Prize has spurred low-orbit travel innovation, Nick's cheap laptop has got Chinese and Taiwanese vendors to think differently about how laptops are made (and used). Intel at first disparaged the effort, and then came up with their own 'Edu-wise' subnotebook. The next phase of this revolution is the much anticipated launch of the Asus Eee PC subnotebook. Imagine this: The Asus "Eee PC 8G" is pre-configured with 1GB of RAM, an 8GB SSD, and webcam for US$ 399. And for only US$ 299, you get 4GB SSD, a bit less RAM and no webcam. This little puppy rocks! If nothing else, it will be a wonderful ebook reader. For more information check out the official Asus Eee PC website, view a recent video review, or discuss it. 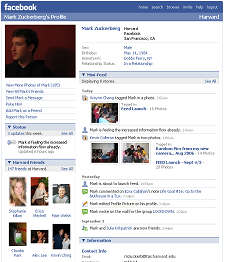 Facebook (FB) is expanding its relationship with Microsoft, and proving that its a good investment vehicle. "Facebook and Microsoft Corp. today announced that Microsoft will take a $240 million equity stake in Facebook’s next round of financing at a $15 billion valuation, and the companies will expand their existing advertising partnership. Under the expanded strategic alliance, Microsoft [Adcenter, Google Adwords competitor] will be the exclusive third-party advertising platform partner for Facebook, and will begin to sell advertising for Facebook internationally in addition to the United States." But is it a good communications vehicle? I personally feel that FB has too much friction to be a good communications medium. I keep it open most of the time, but the messaging is still very much like webmail. The apps are kind of cute but not very useful. I do think it's great for media sharing and building a sense of community, but am already looking for the next generation of social media sites that offer more of a sense of a conversation. Did anyone notice that winners of the Nobel Peace Prize are often also great communicators? 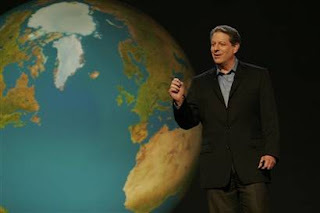 Al Gore, whose film Inconvenient Truth and global Live Earth campaign have awakened a nascent environmental movement, has won the Nobel Peace Prize for 2007. He now joins an illustrious list of peace prize laureates that includes Martin Luther King, Mother Theresa, Nelson Mandella, Jimmy Carter, and the Dalai Lama. Gore was tipped for the prize based on his "wide-reaching efforts to draw the world’s attention to the dangers of global warming". He had my vote for what was arguably the best PowerPoint presentation ever delivered.